Started off this morning at first light. The light rain from the night before did not raise the flow but the deeper pools appeared to have a slightly darker green in thier color. I took a walk and found a pod of fresh fish. I missed more than I caught. The float would go down and I would lift . The result would either be a few head shakes and spit out or just a light bite quick tug. 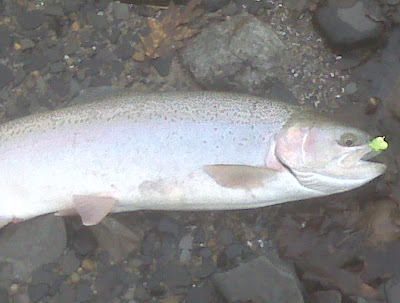 all fish were taken on pink and chartrueses sacks and one came on a white jig. I decided to move down the stream and hip high into the water as God did not bless me with distance casting skills with a centerpin. I really need to work on my casting skills and finesse as I tend to lose them from time to time during the season. Either from being too anxious or casting into a wind etc. I have days where I look like like a green newbie. Oh well it's about getting the float in the water. right? After a few fish I realized I was getting a little cold and my socks were wet. The neoprenes had finally failed and I discovered two pin hole leaks in each knee. I figured even if I get chilled, I am a hop ,skip and a job from the creek. By the time I took off the waders I was damp from toe to thigh but all and all a good day. I will have to tough it out with the waders until the end of the season and pick up a new pair before next fall. Time to throw some clothes in the dryer. 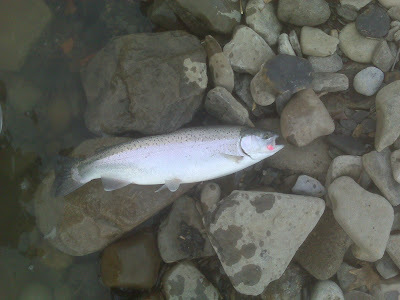 It is raining as I speak so there is hope of an increased flow to draw more fish in. Nice report! Thanks for posting. BTW...I have been harbouring a few leaks in each leg of my breathables since the middle of last fall. I have aquaseal but no ambition. LOL!!! Until I am literally swimming I suspect the holes will be a reminder of fondness for the couch. Seriously...I love that f*ckin couch!